DeLorme RAM Motorsports Mount for PN-series handheld GPSs. It's more rugged than I thought. Click on image to go to DeLorme page. On my first ride of the 2011 season, I did the usual: I took along my DeLorme PN-40SE GPS receiver. And, I had it tucked sort of into the tank bag map folder. Continuing with the usual, it collected the track, but was otherwise pretty useless as I was riding. I especially wanted the speed reading as the speedometer on my old 1994 Yamaha Seca II reads higher than my actual speed. About halfway along the ride, the thought came to me: just buy the stupid bracket!! I’d been avoiding it because of its $50 cost. But it seemed to me that having the GPS out and available while riding might have its benefits. I ordered the RAM Motorsports Mount for PN-Series Handheld GPS from DeLorme. I was pretty concerned that nothing could hold up to the pounding the dirt bike gets, so it was with some trepidation that I opened the box. I was pleasantly surprised by the choice of materials. Plastic, yes, but of the industrial kind. Light as a feather and strong as an ox. It consists of three main parts, as shown in the photo below. DeLorme RAM Motorsports mount for the PN-series GPS. 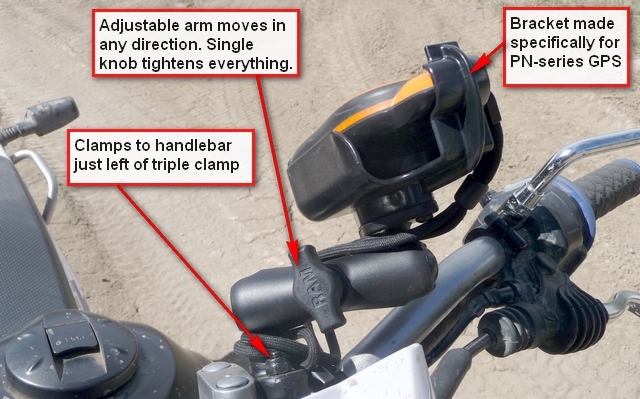 It fastens securely to the handlebar in any handy vacant spot, in this case just to the left of the triple clamp. There's an arm that has a ball mount at each end--a single knob tightens everything at once--very convenient. The sleeve for the GPS receiver is a perfect fit and the top snaps right on. This is what it looks like while riding. 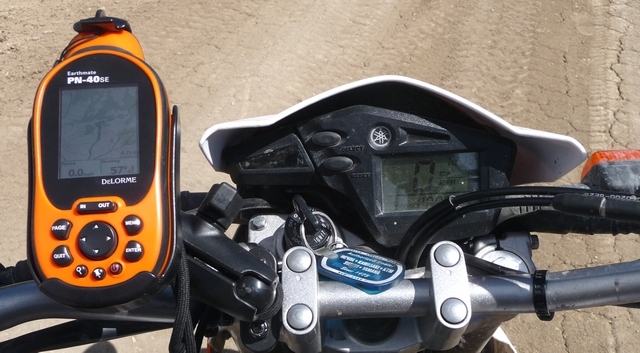 The GPS is easily viewable while riding, does not cover up any instruments, and isn’t in the way of any of the controls. I was particularly interested in the real-time speed reading, as the speedometer on the XT-250 is pretty far off given that I put on a different front sprocket. Since the GPS receiver is now firmly planted in one place, a quick glance gives me my speed. And…here’s the unexpected benefit: while it is true that many of the roads indicated on the GPS base map aren’t really there, I found some that really were there that I’d overlooked. Very cool. Is it worth the $50 (actually $49.95 plus tax and shipping)? For me: absolutely! This entry was posted in GPS Tracks, Product Reviews and tagged DeLorme PN-40SE, DeLorme RAM Motorsports Mount for PN-Series GPS, dirt bikes, motorcycling, PN-series bracket, PN-series mount. Bookmark the permalink. I have a ram mount for my Garmin gps map 60cx (everyone i my club uses the 60 and the maps/tracks are all in Garmin). Anyway, from your picture mine locks in a little more secure than yours. It was fine until fall of ’09 with about 200 hrs of RUFF use, it started jumping off. I run off the bikes battery so the cord kept it “on” the bike…luckily. So I zip tied the top. After a while it started popping out from the base. Some one suggested using shelf liner, the rubber web stuff, in the base. That tightened it up and I keep the top zip tie on. The wear appears to be just the plactic case wollowing out, but I would need to buy another ram mount to see which it is. I prety much leave it in the cradle all the time once the season starts and I can still access the ports ok. We are hoefully getting out first time this weekend but looks doubtful right now. Just starting to get some daytine highs in 50’s. Normal is did lower 50’s so cold spring so far.